Below is a summary of regular newspaper products. Each publication offers valuable information for readers and serves as a necessary advertising medium for businesses looking to reach our trade areas. For more specific information about these publications or for any other general questions, please contact us at 1-800-325-6440 or send us an email. With a paid weekly circulation of 2,560 the Pipestone County Star covers all the news of the Pipestone, Minnesota area. The County Star has been in circulation since 1879, never missing a week's edition. The County Star is published every Thursday. Deadlines for news submissions are Monday by end of day, while the advertising deadline is Tuesday by noon. The Free Star is distributed every Monday free of charge to over 11,000 households around the Pipestone trade market. The Free Star features retail, classified, entertainment, and community event advertising. The weekly editions also contain current information on all the happenings in the area. Advertising deadline is the Friday prior to publication at noon. View the Free Star online complete with links to advertiser websites. The Farm Market News is delivered to over 18,000 rural residents in parts of 10 counties in SW Minnesota, three counties in SE South Dakota, and three counties in NW Iowa. In addition to this rural resident delivery, there are also copies available for pickup at local coffee shops and business places. The publication is published the first and third Monday of every month. This paper is full of advertising and auction information and features news stories about people in ag. The Farm Market News reaches more rural households than any other farm publication in the SW Minnesota Market Area. Advertising deadline is the Wednesday noon prior to publication date. For a complete listing of upcoming auctions from around the region visit www.farmmarketauctions.com. The SW Minnesota Peach is published weekly as a common supplement to 16 newspapers covering a nine-county area of SW Minnesota reaching over 20,000 households. The Peach is full of advertising from around the region. As an advertiser, this publication provides to you an excellent means with which to reach a broad geographic market. The Jasper Journal is the only newspaper serving solely the Jasper, MN market. The Journal features local news, information, and advertising on a weekly basis. The publication is delivered each Monday. Deadline for news and advertising is Thursday prior at 5:00 PM. For information call: 1-800-325-6440 or email us. The Outdoors Weekly is Pipestone Publishing's sportsman's magazine. Published the first week of every month and updated daily online with news and photos, Outdoors Weekly features great articles and sponsored messages proven to provide sportsmen with the tools they need for a successful hunt or fishing trip. Each edition is complete with user submitted photos of their outdoors successes, regional fishing reports, and guides to the upper Midwest's best resorts and lodges. Follow on Facebook for even more news, tips, photos, and reports. Throughout the year we produce a variety of specialty publications. Each of these niche products offer great readership and promotional opportunity. Sr. Focus - a nostalgic content focused on various historical topics of Pipestone County. Published quarterly. Pipestone Area Visitor's Guide - An annual guide to the attraction within Pipestone and the surrounding area. Summer Entertainment Guide - This annual magazine features entertainment opportunities to make your summertime in the region even more enjoyable. Spring, Fall, and Holiday Entertainment Guides - Each spring, fall and Christmas season we publish a coupon & entertainment book full of great service and retail values. Home & Garden - This edition comes out each fall and features tips for home and garden improvements. Health & Fitness - Learn updates from the realm of health and fitness to improve your life or lifestyle. Finance Guide - This edition is published in January and provides useful tips for managing your finances. You can view all of our special editions, supplements, and coupon books online by browsing our complimentary e-editions. An annual guide to the attraction within Pipestone and the surrounding area. 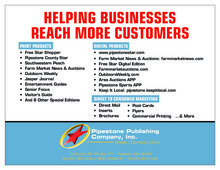 Our Annual Business People Edition features contact information and staff photos for many businesses in the Pipestone Minnesota Marketplace. This edition is available all year long so you can refer back to it as needed. This annual magazine features entertainment opportunities to make your summertime in the region even more enjoyable. A nostalgic content focused on various historical topics of Pipestone County. Published quarterly. Download this PDF file for complete rate and production information for our publications. This file contains rates, deadlines, circulation, and other information. Download "Rate Card Portfolio 2811.pdf"